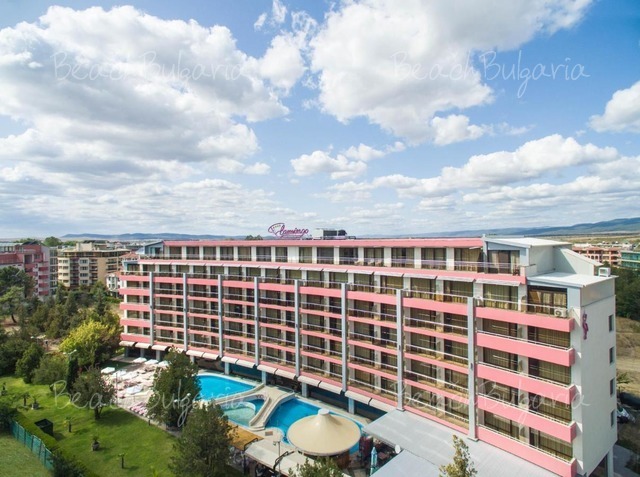 Location: Garden of Eden hotel complex is situated right on the beach, in the heart of a quiet bay and at the same time at the end of the forest, just outside St.Vlas Black sea resort. 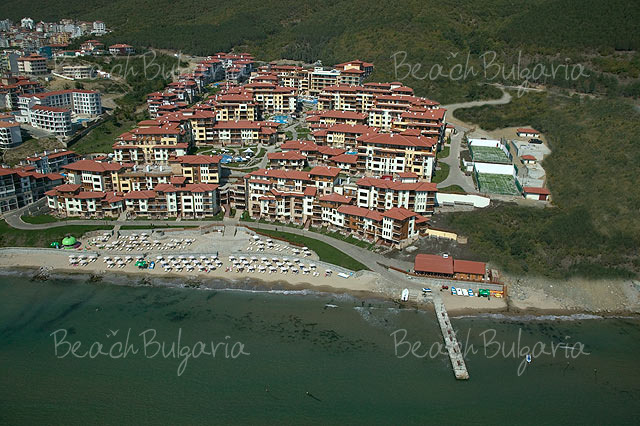 It located 5 km from Sunny Beach, 12 km from Nessebar, 35 km from Burgas Airport. Accommodation: The hotel features 48 luxury double rooms, 6 suites and a suite-deluxe. The guestrooms are individually decorated and offer sea and park views. The 690 apartments (studios, 1, 2 and 3 bedroom apartments) of Garden of Eden complex are individually decorated, air-conditioned and furnished with fully equipped kitchens. Studios /32 - 40 sq.m/ offer dining area, folding sofa, fully equipped kitchenette, double bed, coffee table, balcony, Internet, TV, telephone. Studios are suitable for accommodation of 2 adults and 1 child or 3 adults. Apartments /55 sq.m/ offer separate bedroom, fully equipped kitchenette, dining area, living room with folding sofa, TV, Internet, telephone. 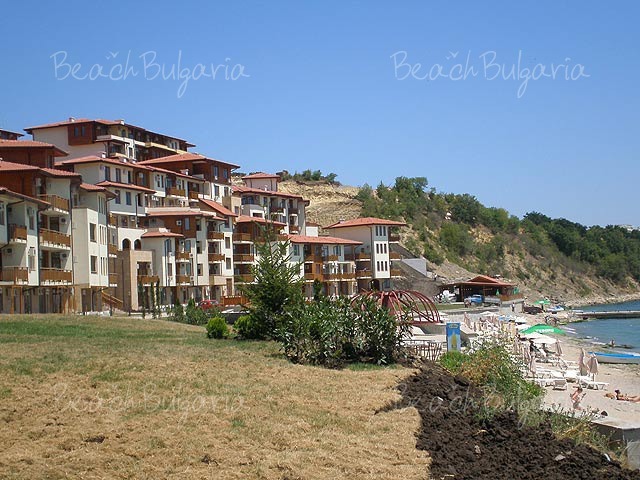 These apartments are suitable for accommodation of 2 adults and 2 children or 4 adults. Apartments /70-90/ offer 2 separate bedrooms, 2 bathrooms, living room, fully equipped kitchenette, dining area, living area with folding sofa, telephone, TV, Internet. 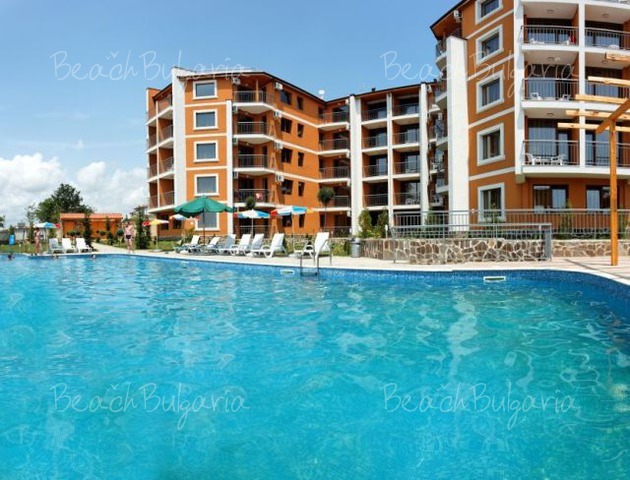 These apartments are suitable for accommodation of up to 5 adults. Apartments /100 – 140 sq.m/ offer 3 separate bedrooms, 3 bathrooms living room, fully equipped kitchenette, dining area, living area with folding sofa, telephone, TV, Internet. 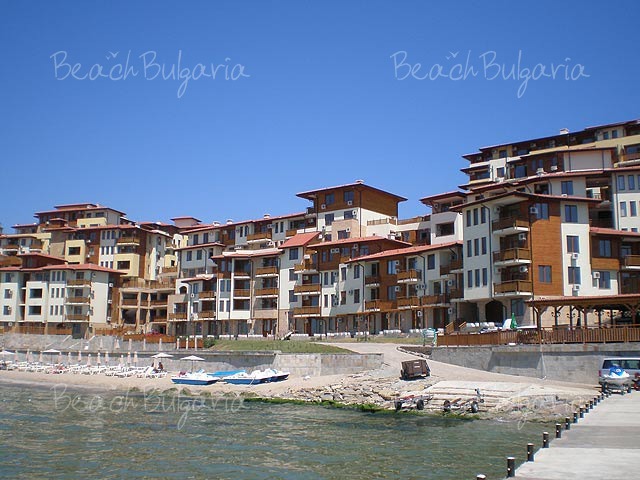 These apartments are suitable for accommodation of up to 7 adults. Bars and restaurants: The complex offers 4 pool-bars, room service, piano bar, beach bar, wet bar and 3 restaurants – Italian restaurant, main restaurant with dishes from Bulgarian and European cuisine and Fish restaurant. Sport: The hotel offers 7 outdoor swimming pools and 1 indoor swimming pool. Each one is with adjoined children section. The hotel offers motorboat, Jet Ski, water-ski, mambo, banana, pedalo, sailing boat at Eden Beach, as well as tennis, darts, billiard, football and volleyball multifunctional playgrounds. The animation team will entertain you every day with: water aerobic, stretching, Bulgarian lessons, water polo, oriental dance courses, rifle shooting, mini football. The SPA centre offers sauna, steam room, professional massages and therapies, solarium, two saunas, fitness club, Turkish bath, Jacuzzi, Beauty Salon, Hairdresser. The prices are in EUR per room per night no meal included. Use of parking, parasoles near the pool included as well. * Maximum capacity: Studio - 3 adults or 2 adults + 1 child; 1-bedroom apartment: 2 adults + 2 children or 3 adlults; 2-bedroom apartment - 4 adults + 2 children or 5 adults; 3-bedroom apartment – 6 adults. * Cancellations can be made free of charge providing details of this are received at least 14 days prior to check-in time on the day of arrival - cancellations made after this period will incur a fee equivalent to the cost of 2 night's accommodation. i want to know if i rent an apartment wit 2 rooms and living for 4 adults and 2 children under 10 years how much will cost for the interval 21.08-28.08 wil all inclusive? Please, post a comment on Garden of Eden Apartments. - 7=6, 14=12 during 06 June - 23 June 2019; 31 Aug - 09 Sep 2019.